The CO Gas Sensor Module is designed to allow a microcontroller to determine when a preset carbon monoxide gas level has been reached or exceeded. Interfacing with the sensor module is done through a 4-pin SIP header and requires two I/O pins from the host microcontroller. The sensor module is mainly intended to provide a means of comparing carbon monoxide sources and being able to set an alarm limit when the source becomes excessive. Parallax does not provide gas calibration data on the module and such data and alarm setting is the responsibility of the user to define. 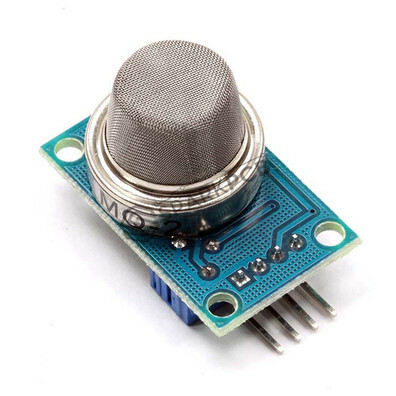 Sensitivity adjustable the blue digital potentiometer adjustment. Before the use of the operating voltage 5V more the 500 ma power supply at least warm-up for more than two minutes, the sensor slightly hot is normal. Small board PCB size: 4.5cm * 1.8cm. 1 VCC Operating voltage 5V DC. 2 GND to connect GND. 4 A0 Small board analog output interface. Gas leakage monitoring device can be used in homes and factories, and is suitable for the detection of CO2, Alert for over-limit of gas concentration.